Sophomores Anna Dale and Sarah Hardy share more than a passion for music. They also share a residence hall room at Saint Mary’s University and now the title of Elevator Pitch Competition winners. Beating out 26 other elevator pitches, Dale and Hardy also share the ability to professionally present an entrepreneurial passion in less than 90 seconds. 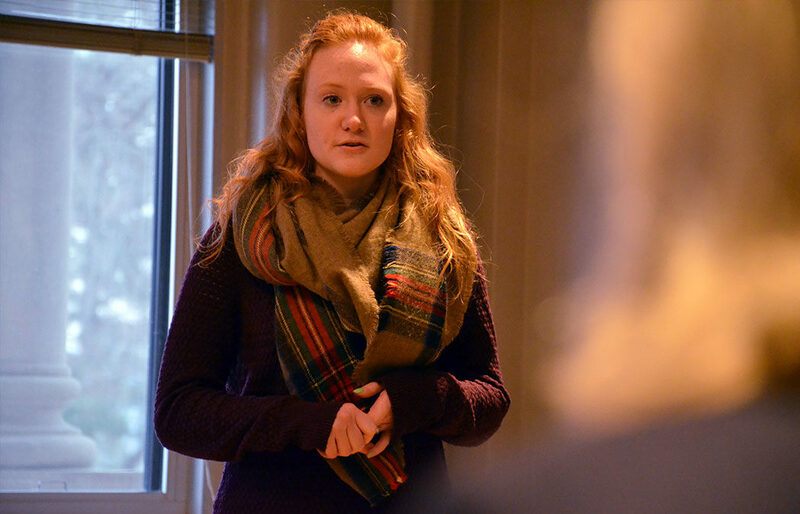 As both students are pursuing leadership minors, they share a few classes. 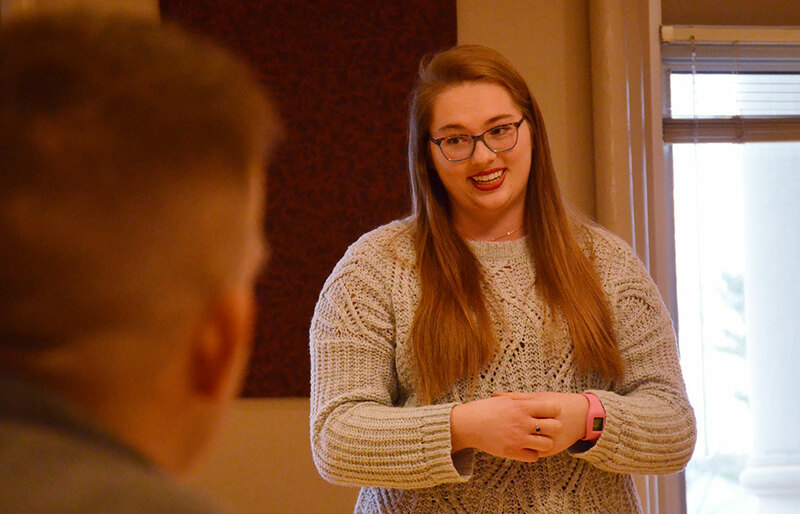 It was in their persuasion and advocacy class where they came up with the idea of “Ensemble,” a nonprofit organization which would provide children and young adults with a venue to learn and enjoy music. “We realized that a lot of music programs are losing funding or being eliminated completely, even at the elementary level. Kids aren’t getting the opportunity to pursue music,” explained Hardy. Dale and Hardy went through the steps of forming a nonprofit, including creating a mission statement, writing a grant letter of inquiry, and even creating a board of directors. Anna Dale presents during the Elevator Pitch Competition. Dale and Hardy pitched their Ensemble idea in the largest Saint Mary’s Elevator Pitch Competition ever. Hosted by the Kabara Institute for Entrepreneurial Studies, the semi-annual Elevator Pitch Competition gives students an opportunity to pitch their business ideas to a panel of judges and win cash prizes. “One of the questions the judges asked us was what the next step would be, and we said it would be applying for a grant that would help us secure a building, start the donation process for youth instruments, and find volunteers in the community,” Dale said. The judges panel was comprised of several professors from different disciplines, including communications, education, business, and psychology. As they listened to students give their pitches, they looked for things like knowledge of what they’re pitching, overall enthusiasm and excitement about the product or idea, public speaking skills, and memorization. It’s no surprise Dale and Hardy, who are also in choir together, were successful at pitching their idea to the judges panel. Before competing, they looked at who was judging and how they could appeal to them. Hardy explained, for example, that they mentioned how music can help with brain development to appeal to the psychology professor judges. Dale said the skills she applied to the competition will be beneficial in her future musical theatre career, which hopefully includes a position at the Children’s Theatre Company or Chanhassen Dinner Theatres. Hardy, a psychology major from Hastings, Minn., is also pursuing a criminal justice minor. She hopes to someday work in a juvenile rehabilitation center and bring music into that setting. The two students both plan to put at least some of their $250 winnings from the competition toward Christmas gifts. Top: Sarah Hardy presents during the Elevator Pitch Competition.